Market time , cross-stitch with a message and arty wax. With markets at Guisborough and on the moors and one being prepped for at Lingfield Point, as I write. There was a fantastic spirit at the market and the sun shone brightly as we chatted to visitors both from the local area and from further afield. Here I am with the stall I share with Geraldine of Bean Creative. 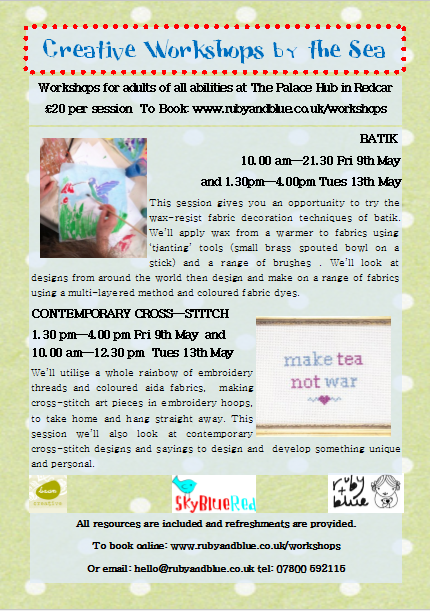 Join us this Friday and next Monday for two really different classes, both of which you can try on either day. During our Batik session, we’ll be looking at tribal and Aborigine art as inspiration for our designs, or you can go with your own ideas! 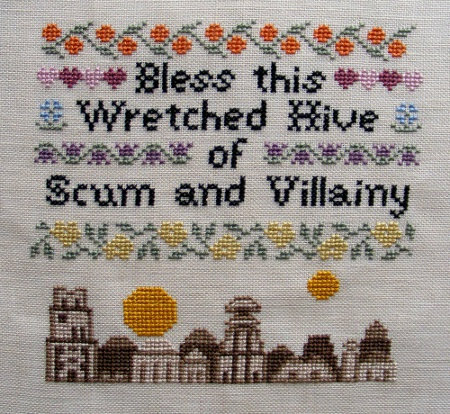 If you want something decidedly less ‘waxy’ then have a try at contemporary cross-stitch, incorporating modern sayings and today’s icons with this traditional craft. If you want to look for some inspiration, look no further than our favourite cross-stitcher ‘Mr x-stitch’, the male sewer you may have seen on the ‘Kirsty’ programes on the TV. Take a look at his blog and ‘stitchgasm’ spot at http://www.mrxstitch.co.uk or click here.